- All DVD's on this page are printed with color label side. Most of the NTSC discs are factory-pressed originals. Priced under $9 are mailed in paper sleeves, higher priced are in Amaray case. - Low shipping cost by first class mail. Seven great DVD hits by BBC director Adam Curtis. Available in NTSC or PAL, region-free formats. Note: The works of Adam Curtis (except his latest two) are only available as recordings taken from BBC broadcasts. Video quality will not be on a par with an original digital release. (1) The complete Power of Nightmares, all 3 parts, 3 hours. The government keeps the terror phantom going, to keep the government in power. Clamshell case $7.50, in Amaray case, $8.99. (2) The Century of Self, an expose of mass-market brainwashing techniques, and the Freud dynasty. All four hours on one disc, in clamshell case, $7.50, in Amaray case, $8.99. (3) The Trap, all three parts on one disc. A highly intelligent film. Exposes the dire effects of materialistic behaviorism ideas like game theory and shock "therapy" on society, health, education. Read about The Trap on Wikipedia. Clamshell case, $7.50. In Amaray box case, $7.99. Adam Curtis Trilogy, in Amaray box case: All 3 programmes above on 3 discs for only $17.99. Four by Adam Curtis: Trilogy pllus Living Dead, 4 programmes on 4 discs, in Amaray box case as shown, with disc designs on white background $19.99 (PAL or NTSC, region-free). Factory replicated with disc designs on dark background as shown at right, $22 (NTSC region-free only. The Living Dead only available in white background version). (4) The Living Dead, 3-part series. Curtis explores how history is manipulated to control us in the present, NTSC or PAL, $7.50 Read more here. Mayfair Set and Pandora's Box are available together in a single amaray box case. If you order both they will be shipped this way, unless you request separate packaging in the shop cart Comments. (6) Pandora's Box. Six episodes on the pitfalls of misplaced faith in science and technology. On 2 discs in Amaray case, NTSC or PAL, $9.95. (7) All Watched Over by Machines of Loving Grace, NTSC or PAL, Clamshell Case, $7.50. How the belief that we are like machines induced us to give up control over our lives. In Amaray case, $8.99. (1) and (2) Century of Self and Power of Nightmares in Amaray box case, $12.99. All 8 discs in paper sleeves, $35 and reduced postage on international shipping. There are extensive descriptions of all these Adam Curtis films on Wikipedia. 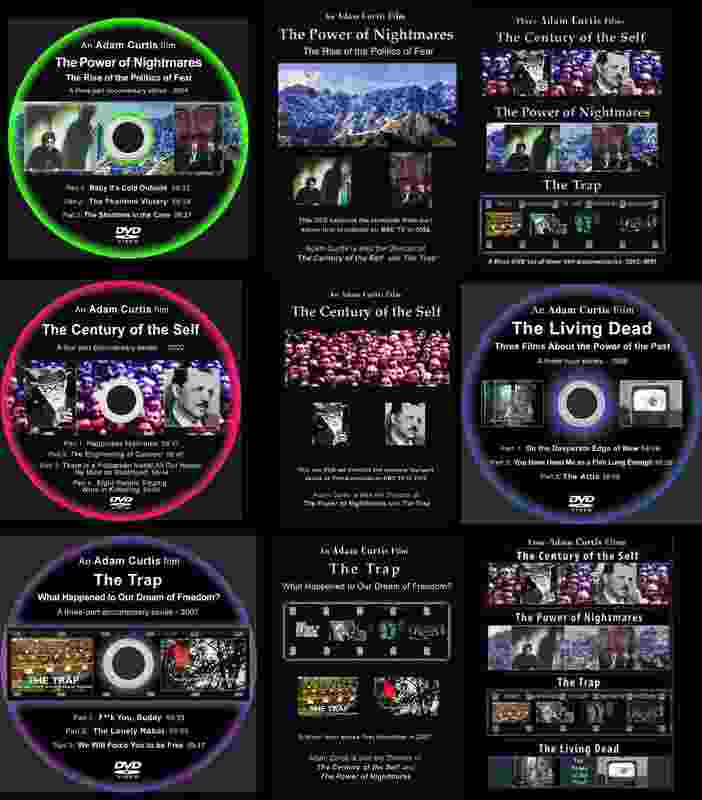 Our Adam Curtis films are available either in NTSC or PAL format. We'll try and send the format for your region unless you request otherwise. Other DVD's listed below are in NTSC-region-free format only. The Big Picture. Maxwell Igan's epic covers topics like 9/11 Truth, fake conspiracy theories like Planet X, consumerism, flouride, JFK. Only $4.00 here. Bill Moyers: The Secret Government, PBS 1987, 1:26 (with short subjects and 1 episode of Power of Nightmares), $4.95. Webster Tarpley in Arizona, March 2007, speaking on Truth Squads and Strategy for 9/11 Truth. One of his most masterful presentations. 1:58. $7.49. See also complete 7-disk set of Arizona event: 7-disk set: Best of the Arizona 9/11 Accountability Conference 2007, only $27. 14 hours, 24 speakers, including "9/11 Truth Squads - A Strategy for 2007" by Webster Tarpley. More details here. "Understanding the Dynamics of 9/11" - Webster Tarpley in Vancouver, June 2007. 2 hours 48 minutes, $7.49. Golden Age of 9/11 Truth Events: All 12 of Tarpley's DVDs. Set of 12 plain silver DVDs in paper sleeves. $20. Details here. "9/11: Blueprint for Truth - The Architecture of Destruction" from Architects & Engineers for 9/11 Truth. The factual new DVD that is opening the minds of building professionals and exposing the truth of 9/11 to everyone. 2 hour multi-media presentation demolishes the 9/11 lie. "2008 Research Edition" in Amaray case, $14.95. Research edition, just $3.99. Nanothermite, with Steven Jones, 88 min., just $3.99. "Did you know a 3rd tower fell on 9/11", just $2.99, San Francisco Conference, just $3.99. 9/11 and the Neo-Con Agenda: LA Scholars Symposium, June 25, 2006 (Alex Jones, Prof. Steven Jones, Bob Bowman, James Fetzer, Webster Tarpley) 1:44:13, plus: Michael Meacher and A. von Buelow on Dutch TV, 16:22. Most popular show in C-Span's history! Clamshell. $7.50. 9/11 Overview - 9 tracks for $7.95 DR Griffin, Meacher, Von Bulow, Steven Jones, BBC Power of Nightmares, SF Inquiry, Rovics Reichstag Fire, Charlie Sheen. 125 min. Clamshell case. 9/11 - The Myth and the Reality: DR Griffin at the Commonwealth Club, San Francisco, and Grand Lake Theater. 95 min. $10. 9/11 and Nationalist Faith, by DR Griffin, $10. 9/11, American Empire, and Christian Faith, by DR Griffin, $10. 9/11 Flights of Fancy, by DR Griffin, $10. Perspective on 9-11, by DR Griffin, $10. Deceptions, by Chris Pratt. 9/11 Lies, Bush's WMD Lies, Obama's 'Change' Lies, Banksters - Goldman Sachs, Bernanke, Rothschild & Rockefeller, Media Control & Propaganda, New World Order, Be Aware, Be a Citizen Journalist. Amaray Case, Shrink Wrap, Overview Pamphlet. Only $8.99 here. Loose Change Final Cut. In clamshell case with color label side, $5.95. Barebones copy with small sticky label on silver disc, $3.49. Alex Jones Great DVD's - All come in cello-wrap Amaray cases. America Destroyed by Design - Inside story of the Oklahoma City bombing. $9.00. American Dictators - Documenting the staged Skull & Bones election of 2004. $6.00. 7/7 Ripple Effect The Truth Video of the London Tube Bombings, with bonus feature Ludicrous Diversions. $7.77 here in NTSC or PAL version. Life in Occupied Palestine: Eyewitness Stories and Photos, $7.95. Buy the DVD together with Anna's book Witness in Palestine: $21.50. More info at Anna's website, AnnaInTheMiddleEast.com. 9/11 Missing Links. 2 hour documentary on the people and firms who committed the 9/11 atrocities: Mossad, their helpers and Neocon networks in the US government. Only $4.00 here. Crimes of Israel. Compilation of four very revealing documentaries: Gaza: The Killing Zone -- Checkpoint -- Israel's Next War -- Israel's Secret Weapons. Only $4.00 here. The Easiest Targets. 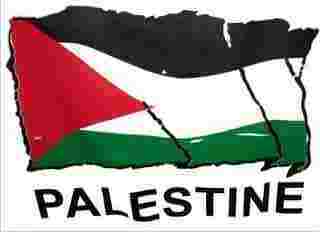 Seven short subjects on the repression and the media war on Palestine. From IfAmericansKnew.org. Shrink-wrapped Amaray case. Sold out in Amaray case. See our shareware DVD list for barebones copies. The Final Solution to Adolf Hitler. Narrator Jim Condit Jr. takes us on a tour of rare books that reveal the incredible history of Nazism and Zionism: two faces of one coin issued by international banksters. Spellbinding stuff for history buffs. Only $4.00 here.